The Government of the Province of Santa Fe through its SantaLab initiative, and the Civic Innovation Project of the Ibero-American General Secretariat (SEGIB), are launching this call for the registration of collaborators to develop civic innovation projects at the Civic Innovation Lab – Argentina (#LABICAR), which will be held from 9 to 21 October 2018 in the city of Rosario, Argentina. The LABICxlaPaz – Nariño will be assisted by the Ministry of Culture and the Ministry of the Interior of Colombia, Nansen Center for Peace and Dialogue of Norway, Zaragoza Activa, Medialab-Prado, Instituto Procomum, the Open Government Lab of Aragon, and Silo Arte e Latitude Rural. This opportunity invites proposals for candidacies for collaborators who wish to take part by becoming involved in the design and prototyping of new tools, platforms and actions of the civic innovation projects chosen in a recent bid to be developed during the laboratory. Through collaborative methodologies, 10 projects will be prototyped with the assistance of work teams formed of the project promoters, a group of 90 collaborators (9 per project) and the continuous support of four specialized mentors, technical specialists and local guest mediators. Each project produced jointly with local communities. Description The estimated incidence of cerebral palsy (CP) in Argentina is about 1,500 new cases per year, a large proportion of which occur in low socio-economic households. Children who suffer from CP develop different types of disorders, including speech, digestive, musculoskeletal and sensorineural disorders, as well as intellectual deficit, exacerbated by the lack of activity and sedentary lifestyle. In addition, they usually experience societal disadvantages, such as reduced social integration and less academic and labor opportunities, as well as a lack of accessibility in public spaces. The aim of this project is the manufacture and upgrading of a standing wheelchair, alongside the training of parents or any other interested member of the community in the use of the basic tools and techniques necessary for the manufacturing, assembly and repair of these wheelchairs. A standing wheelchair allows an individual to go from a sitting to a standing position, thus providing a variety of benefits to the users. Description The Qom are a displaced indigenous community living in a state of social exclusion in the suburbs of Santa Fe and Rosario. The project aims to foster a community-network of Qom women artisans and empower them through the collaborative creation and selling of their products, setting up a self-managed community where they can make decisions for themselves. The final goal is to achieve the economic sustainability of their families, thus reducing inequalities and aiming towards a greater participation of these women within the political and economic spheres of their communities. The project will be carried out in partnership with Qom communities from Rosario, although the possibility of carrying it out in other indigenous communities will be explored, while taking special care to recover and enhance their ancestral knowledge and techniques. Description In an age when we can have instant access to images of any object via the Internet, there are many people with disabilities who have no access to such information. This project is especially targeted at children with visual impairment, who are beginning to discover the world in which they live, aiming to give them access to information and knowledge through objects printed in 3D. Scale models of useful objects for educational purposes in a number of fields, such as human anatomy (allowing visually impaired people to examine reproductions of bones, organs, etc. by touch), art (including reproductions of sculptures and the like), biology (reproductions of animals and plants), etc. The project would be implemented in schools and other academic centers, associations representing visually impaired people, cultural centers, etc. as well as in other informal settings (teaching outside formal school and traditional education). Social communicator or documentalist with experience in audiovisual realization. Descripction The majority of seeds used for agriculture are pelleted seeds, that is, coated with various materials to protect them from pathogens and preserve them in good condition until germination, thus increasing their productivity, their efficiency and their level of protection against predators, as well as easing mechanization. However, seed pelleting is a technology mostly subject to trade secrecy and in the hands of transnational corporations, hence the available information on formulae and coating materials is rather limited. Collaborators profile Graphic designer for documentation / Manual design. Maker, or people who are good at making things with their hands. Description The project aims to use a disruptive technology to prototype the first tool for citizen participation based on blockchain (which could also be used for elections and referenda). This is the most advanced encryption method, so such a prototype would represent a major step forward in cybersecurity during electoral processes. The technology based on blockchain (which is currently used by Bitcoin, for instance) ensures that data cannot be altered, turning it into the safest method for transferring information and also into a great ally for the exercise of transparency and advanced democratic practices, ensuring that the data are a true reflection of citizens’ electoral participation. This tool could be of use to social movements, communities, organizations, governmental bodies, municipalities, guilds, labor unions, etc. Communicator or documentalist with experience in audiovisual realization. Description This project aims to implement a circular aquaponics system for the simultaneous agro-ecological production of red tilapia fish and vegetables (such as chard, lettuce and cedron) for low-income households. The project involves the setting up of a water recirculation system and combines aquaculture and hydroponics, creating a symbiotic environment where plants, fish and friendly bacteria interact. This represents a new mode for organic food production with a series of advantages, including the independence from meteorological phenomena, the production of crops out of season, a great saving of water, fertilizers and pesticides, and the possibility of its implementation on small plots of land. All of the above represents a substantial reduction in production costs, and a contribution to the preservation of natural resources, to soil conservation and, especially, to the development of strategies which promote food safety and the economic sustainability of low-income households. Description This project aims to set up a group based in Rosario (and a platform at a later stage) for the promotion of political and cultural activities and activism in Latin America, to fight against gender inequality in the publishing industry and artistic production. To this end, this group of women will work towards enhancing the visibility and recognition of women’s production in public and virtual spaces, by using different cultural devices and facilities. The project will be carried out in partnership with a number of groups of female artists from Rosario and Santa Fe, which clamour for more visibility and greater female participation in the cultural and artistic world of those cities. Description The project aims to set up the first specialized platform in Argentina for the exchange and sale of fair-trade products which will allow for the verification of a number of features of this type of trade, such as the official organic seal, agro-ecological requirements, gender inclusiveness, horizontal organization and formal employment. There is an increasing social awareness towards responsible consumption and a greater demand for healthy products which are environmentally friendly and support local development. However, when it comes to buying these products, the consumers’ options are spread out and erratic. Having said that, the final purpose of the platform is to connect users who are willing to buy local, environmentally-friendly products with workers and small cooperatives offering anything from food products to clothes, stationery (paper, cardboard, etc.) or responsible services (such as office waste management). The platform would use the peer-to-peer (P2P) technology, just like the websites for Amazon, eBay and MercadoLibre, for instance. 1 Expert in environmental sciences, agronomy, etc. Description Latin America accounts for 78% of the murders of transsexual people reported worldwide. In contrast, there is an increasing social awareness regarding the need to include and support this community. As a consequence, transsexual people are demanding ways to access centralized and systematized information about organizations and settings which can offer them support and a safe environment. This proposal aims to create the first transsexual and transgender-friendly directory of safe havens in each country, as well as of local projects linked to organizations, associations and NGOs dealing with the issue. The project will create an intuitive and easy-to-use platform, with links and information which can be downloaded and structured for each country. The initial idea is to focus on the Ibero-American context, although the possibility of covering other regions will also be explored. Web Developer Cultural Manager or communicator to document the process. Description The state of art in educational science stresses the importance of using digital technologies for learning and leisure activities targeted at individuals with Down syndrome. This project will develop an application which uses real virtuality as a tool to support leisure and learning processes for these people. The use of multimedia technologies offers interactive and immersive experiences which can enhance aspects of the learning process, such as hearing, memory and attention, both selective and long-term. The project presents another innovative aspect, as the application will be designed and developed as part of a joint effort with representatives from the Down syndrome community of Rosario. In other words, these individuals will not only benefit from this technology but they will also play an active role during the whole creation process. 1 Social communicator or documentalist with experience in audiovisual realization. Anyone interested in taking part in the laboratory must fill out and send the form below. Ninety collaborator places will be allocated, of which 25% will be set aside for residents in the Province of Santa Fe, 25% for residents in Argentina, and 50% for international participants. With respect to the selection of participants, the organization will assess the candidate’s profile, their experience, availability and reasons for taking part in the laboratory. In addition, in each group, there will be a collaborator who will mainly take charge of documenting the processes and work dynamics and their results and of communicating them externally via a digital platform, social networks, etc. Results will be published on the Civic Innovation website as well as by direct correspondence, via email, with selected collaborators. Registration is free of charge and will be open until 24 June 2018. We believe that Civic Innovation means any process that settles social problems using ground-breaking open technologies (digital, social, ancestral) and methodologies via the involvement of the affected community itself. This definition means that citizens cease to be the passive recipients of institutional actions to become the protagonists and drivers of their own alternatives through an empowerment process that is much more democratic (bottom-up solutions), much more resilient, owing to the effect of learning by doing and trial and error, and, above all, much more dynamic and efficient because it has the knowledge of the communities themselves. Civic innovation laboratories (LABIC) are spaces designed to ensure that this can happen; to systematize and fast-track these spontaneous, citizen-driven innovations in communities, in neighborhoods, which transform local realities and have the potential to be copied in other cities. Spaces that can be used simultaneously for experimentation, learning and prototyping of ground-breaking proposals. The LABICs are inspired by Medialab-Prado’s production workshop structure, which has been adapted and new developments added. For at least 10 days, they are the assembly point for a variety of projects that are developed collaboratively by multidisciplinary teams of citizens of different origins, making the laboratory a space for the delivery of specific proposals by citizens for citizens, as well as a space for intercultural interaction. This will be the fifth edition of a LABIC; the first was held in 2014 in Veracruz, Mexico (#LABICMX), the second in Rio de Janeiro, Brazil in 2015 (#LABiCBR), the third in Cartagena, Colombia in 2016 (#LABICCO), and the last one in Pasto Colombia) as a part of the post-conflict strategy (#LABICXLAPAZ). Each edition of the LABIC is updated in keeping with the best proposals by the participants themselves, the lessons learnt by the organizers, and the characteristics of each context. In this opportunity, the LABIC will contribute to the Sustainable Development Goals (SDGs) from a citizen perspective, promoting social cohesion. What are the SDGs? On September 25, 2015, world leaders adopted a set of global goals to eradicate poverty, protect the planet and ensure prosperity for all as part of a new sustainable development agenda to be fulfilled in the next 15 years. The global objectives proposed by the United Nations are 17 in total, and the interesting thing is that these objectives not only institutions or governments can contribute, but also citizens and their ideas. For this reason, for this Civic Innovation Lab we have selected 5 SDGs that serve as general themes to which projects can be focused to generate very specific proposals. The purpose of this call is to select a maximum of 90 collaborators to develop collaboratively the 10 projects recently selected in open call. This call for collaborators is targeted at any person or group interested in the proposed projects, above and beyond their level of education, specialization or experience. For example, artists, engineers, sociologists, architects, town planners, educators, programmers, psychologists, journalists, ecologists, graphic designers, cultural managers, ancestral cultural tradition holders, community leaders or anyone else interested in the proposed subjects. We especially urge groups of young people, indigenous persons or afro-descendants, women, the disabled, teachers, LGTBI social sectors, among others, to participate. The role of the collaborator in the lab development process is essential. The collaborators will have the chance to join the project teams that will develop the selected proposals and work in an environment where a horizontal relationship is in place between mentors, promoters, collaborators and mediators. This represents an opportunity for the interchange of reflexive knowledge and theoretical and practical learning, as well as the chance to collaborate in a multicultural team with people from Argentina, other countries and in conjunction with local communities. Upon termination of the projects, the names of the collaborators will be listed in the acknowledgements in the same way as the name of the project promoter. The Ibero-American General Secretariat will also issue a document certifying participation in the laboratory for all participants who so request. Civic Innovation labs are spaces for experimentation, which are open, collaborative and non-competitive. They are unique spaces where citizens work directly on designing and developing projects that address the specific challenges of their own communities. Proposals will be developed in multidisciplinary working groups formed of the promoter(s) and the interested collaborators, with the conceptual and technical guidance of mentors, local mediators and technical specialists. Project development will also be coupled with work in conjunction with local communities. The organization will provide, as far as possible, the necessary resources for carrying out and documenting the selected projects. Throughout the laboratory, different activities will be scheduled, such as talks, presentations, seminars and specific workshops. Working days will be adapted to the projects’ specific requirements, in accordance with the activities and timetables of the facility where the laboratory will be staged (morning and afternoon). It is usual for teams to work a full schedule every day (except the free day). Participants will be urged to prepare adequate documentation on the projects developed, both during the course of the laboratory as well as following its conclusion. The use of free software and hardware tools will also be encouraged. Results publication shall be under free licenses and in open repositories that allow access to and dissemination of the knowledge produced during the lab. Before the laboratory begins, the organization will get in touch with all the members of every group so that they can plan any preliminary work that needs doing for the project in preparation for the laboratory. The laboratory will take place in Spanish, with no translation. From 9 to 21 October inclusive, the organization will cover, for non-Rosario residents, the stay (shared rooms, up to three people) with breakfast, lunch and dinner. For Rosario residents, it will cover lunch and dinner on the same days. Transportation from airport-hotel-airport will be paid by the organization. Where necessary, collective daily transportation from the hotel to the lab venue, and vice-versa, as well as transfers to local communities taking part in the development of the project will be paid for and arranged by the event organizers. Collaborators residing outside Argentina must take out health insurance on their own account. They should also find out the requirements for obtaining a visa for Argentina if necessary for their nationality (view here). The selection committee will be formed of the SEGIB Civic Innovation Project, and the SantaLab team of the Government of Santa Fe, with the counseling of the Ministry of State Modernization, and mentors. – Diversity in origins and gender balance will be taken into account. The works developed will be presented publicly by the promoters and collaborators on the final day of the laboratory. Furthermore, participants authorize projects and/or their documentation to be published on the organizers’ webpages. At a later date, the Organization will conduct a study on the future viability of the projects so that they can be implemented in other contexts. Selected individuals or bodies corporate may use equipment or materials that have been previously requested and awarded. Project authors shall pay any expense that is unforeseen or not approved in material or equipment rental. Developed projects shall be under free licenses with author attribution and enforcement of the “share alike” clause is recommended (in a Creative Commons license it would be BY-SA). 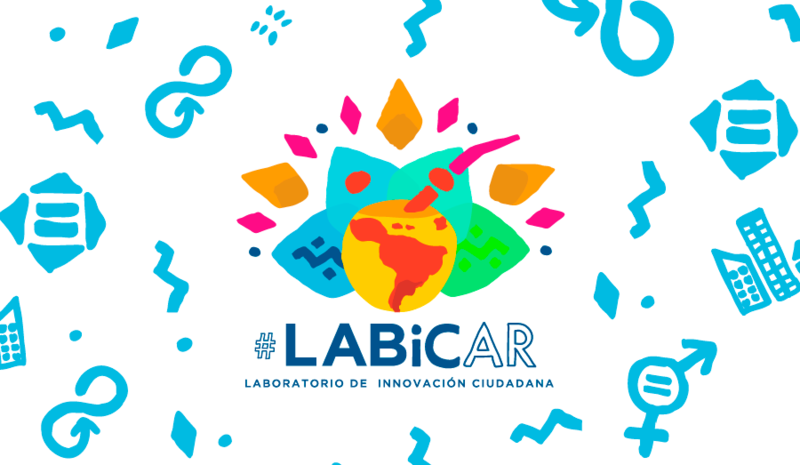 In turn, whenever these projects are shown at festivals and/or exhibitions and whenever their pictures are reproduced in catalogues and/or webpages, their connection with theCivic Innovation Laboratory – Argentina (#LABICAR) shall be mentioned. Furthermore, the names of the people who collaborated in developing the projects shall always be stated. The organizers are not liable for any data or contents that participants may use. Neither is it liable for any royalties or rights applicable to third parties pursuant to respective laws. The #LABICAR is an event lasting several days; hence, we trust in the responsibility of each participant over this period. The organisation shall not be held liable for any theft or loss of personal belongings or for physical injury to persons. The LABIC does not pay any economic remuneration to its participants on the understanding that it is a space for collaboration and contribution by everyone for the benefit of the community. Committee members may make any clarifications, amendments or interpretations they deem fit. Any circumstances not foreseen in this call for projects will be solved by the Committee. Decisions, grading and results shall be final. We focus on collaboration and not on competition. Ideas have value in themselves and not because of the person proposing them. We drive the common good, not gurus. We defend the right to information, knowledge and participation. Dialogue and free interchange guide our activities. At the LABIC, we encourage free licenses and open repositories as a way of ensuring transparent knowledge and its dissemination. Expressions of hate or intolerance in matters of gender, race, ethnic group, social position, sexual or religious orientation or origin are unacceptable. Who can take part in the laboratory as collaborators? Anyone over the age of 18, who wishes to work in a group contributing their knowledge and ideas in the development of one of the selected proposals in tandem with learning from the rest of the group and from the laboratory mentors. What does this laboratory offer to people taking part as collaborators? An exceptional multicultural environment for collaborative learning, where citizens have a space for contributing to the building more sustainable communities. Collaborators’ names will be included in the acknowledgements of the developed project. Likewise, the SEGIB Civic Innovation project will provide a document certifying participation in the laboratory for any requesting collaborators. The team will also have the chance to make a public presentation of the work during the laboratory and the collaborators will have new personal and professional relations networks available to them. What am I committing myself to if I register as a collaborator? Selected collaborators undertake to develop agreed parts of the project and which relate to their profile and interests. Collaborators will also be committed to attending the lab every day. Where can I find information on the projects open to collaborators? In the selected projects summary. How and when are the work groups formed? The work groups will be formed at the end of the registration period taking into account, firstly, the project preference of the registered person and, secondly, the relevance of their profile to the chosen project. What is the lab schedule? The groups will agree on their schedules according to their needs and availability. Nevertheless, the work is intense and is usually done over an entire day. Programmed and improvised activities, such as presentations, mini-workshops, debates, performances and parties, will also be held. Can I choose which project I want to collaborate on? Yes, it is the collaborators who decide which development group they want to join. Can I collaborate on several projects at the same time? Yes, your available time and the different project requirements allowing. Even so, we recommend that you concentrate on a single project. Two weeks fly by! Can I take part if I am not available to attend the laboratory for two weeks? We recommend as much dedication as possible during the two weeks as it is an intensive lab. Please remember that availability is one of the criteria for participant selection. Participation in this call means acceptance of all of its requirements and contents. If you have any queries, please consult the Frequently Asked Questions section or write to us at labicar@innovacionciudadana.org.